How do you spend time at office? Or, what’s your work routine? Most of us work sitting in a chair, during the whole office hours as long as 8 to 9 hours. The minimum movement we do, involves lunch break. This means our body is in a sedentary state. Human physiology is designed to be in an active state with regular movements. That’s what keeps our body healthy. Sitting continuously for such long duration impacts our body in the most harmful way, you can ever imagine. It doesn’t sound to be heinous but inactivity brings a number of health hazards. At a sitting posture, blood flow becomes slow and the muscles burn very less fat, which results in fatty acids to clog your heart. This increases the risk of heart diseases. Especially in women, the risk is higher for them who sit for 10 hours or more. Your body can react to just one day of excess sitting. The pancreas produce more insulin which leads to diabetes. Sitting majorly affects digestion, making the metabolism worse than anything else. This results in to bloating, heart burn, stamina loss, headache, constipation, cramping etc. Not to be mentioned separately, posture gets affected to the core. Mostly the back gets harmed which may cause diseases like back injury and spondylitis. Swollen legs could lead to more dangerous problems later on. Sitting throughout the day may cause blood clots in the legs. At the same time, bones get weakened. Belly fat is a layer of subcutaneous fat around the belly. Also, belly fat is a form of visceral fat which means it’s in the internal organs. Sitting for long period of time induces weight gain. When you sit for long time, the glucose level is affected which increases insulin resistance in the body. As a result belly fat settles in around the internal organs. In fact when you are in a sitting posture our body doesn’t burn much calories. Combining all these conditions, we get stubborn belly fat which is quite dangerous. Inch loss from belly is quite a tough job. Exercising at a gym or dieting doesn’t aid to reduce the tummy effectively. It’s the hardest area in our body to lose weight. Stretch often: Don’t forget to stretch. We have a habit of slouching and sitting and do not remember to sit straight. In every 30 minutes try to stretch in the chair. Sit straight move forward and backward keeping the body uptight. Get up and walk: Take a break for green tea and walk for a few minutes before getting back to the work. You may take a longer roundabout to your desk. Maintain a minimum distance between the desk and the chair; so that you need to sit straight to reach the desk. Stand straight for 5-10 minutes at your place. While standing try to bend a bit backwards and stretch little. 4 times a day, try to inhale deep and exhale slowly. Repeat this for 5mins at a go. 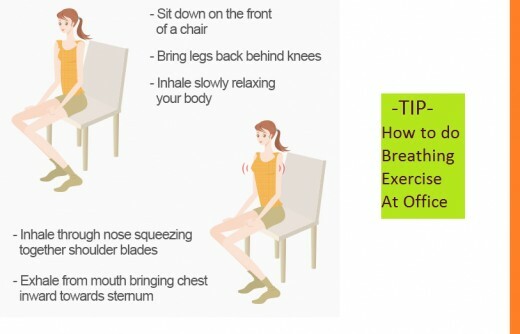 This breathing exercise keep the body active and healthy. Do not sit immediately after lunch. Always take a walk for a minimum of 15 minutes and then get back to work. If you sit immediately after lunch, there are higher chances to get the belly fat. These are a few preventive measures for growing belly fat. What if you already have belly fat? For an average man, a waist size of 34’’ to 40’’ is considered to be overweight. Whereas any waist size over 40’’ is simply categorized as obese. For women the matrix varies between 32’’-36’’ as overweight and anything beyond 36’’ is categorized as obese. While we already mentioned exercise and diet don’t bring effective results if you want to reduce fat from particular body parts especially belly area, there are proven scientific ways to reduce the same. 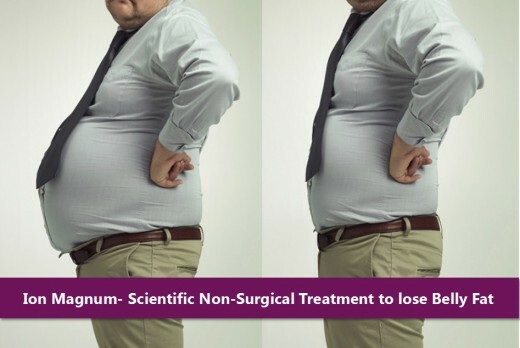 Ion Magnum, a revolutionary global technology, used as a non-surgical and non-invasive weight loss treatment is exclusively performed at Define Aesthetics. In fact, Dr. Sheetal Badami, pioneer of Define Aesthetics was the first to introduce this amazing scientific treatment to India. Any kind of obesity and obesity related problems can be addressed by Ion Magnum treatment under expert and experienced medical supervision. It’s extremely useful to reduce fat from particular body parts. In fact, inch loss from your tummy is possible through Ion magnum. 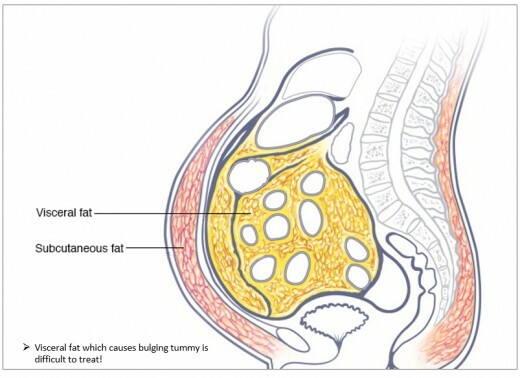 Visceral fat, one of the main reason to grow belly fat is non-curable by exercising or dieting. Ion Magnum technology even works on visceral fat to reduce it effectively. The results are effective and visible within a few sessions. This is an FDA approved weight loss treatment and has no side effects. So far, over 2000 patients have been treated successfully for obesity. We pledge towards healthy life. Do not ignore obesity. Live a healthy life.